Legazpi City, [08.25.17] – In order to uphold the rule of law and due process in the country, the government has to rethink its anti-drug campaign methods, which have been proven to be ineffective and devastating across the globe. This was the message of the Association of Law Students in the Philippines (ALSP) Tuesday as President Rodrigo Roa Duterte’s brutal war on drugs continues to draw criticisms after the death of Kian Lloyd Delos Santos, the 17-year-old suspected drug runner killed in “Oplan Galugad” Wednesday last week. Aaron Marc Dimaano, ALSP secretary general, said that cases like Delos Santos’ lead to a culture of impunity and abuse in the country. The body of slain Kian Lloyd De los Santos is being taken out from the spot where he was gunned down. Google photo. “How long should we compromise our precious human rights for mere short term goals? 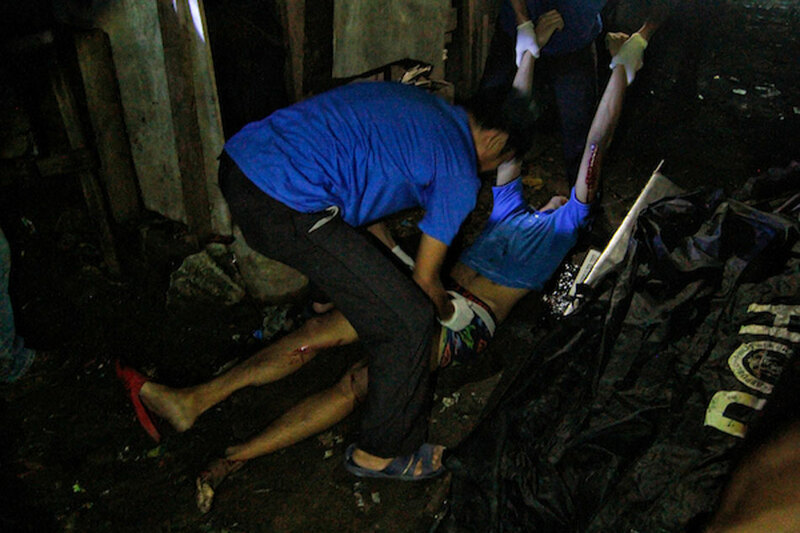 The murder of Kian, an innocent, and other Filipinos who died at the hands of the state’s own security forces, done in such a brazen and cowardly manner, should jolt us to reaffirm the primacy of the rule of law through the institution of due process,” Dimaano said. “The future of Kian, his family and of all those lives lost have now been forever erased for unaccountable gains on this wayward war on drugs that has already been proven to be ineffective and devastating across the world,” he said. The ALSP also called on the Philippine National Police (PNP) to fulfill their duty in serving and protecting the citizenry and to professionalize their ranks. “The ASLP condemns, in the strongest possible terms, police abuse that lead to extrajudicial killings under the guise of the government’s anti-drug campaign,” Dimaano added. They also called for the fair and transparent investigation to determine those who are accountable and to prosecute them to the full extent of the law. Dimaano also said that they are one with the president in his fight against drugs, but the government needs to understand that it is a health issue requiring strengthened public health services and education. “ALSP encourages all law students in the country to remain vigilant in protecting the rights of all, especially the innocent by making sure that our government heed the call of so many in our country to respect the sanctity of human rights enshrined in our constitution,” Dimaano said. On Monday, Dimaano joined some 50 other protesters in Legazpi City in silent protest and candle-lighting for peace.